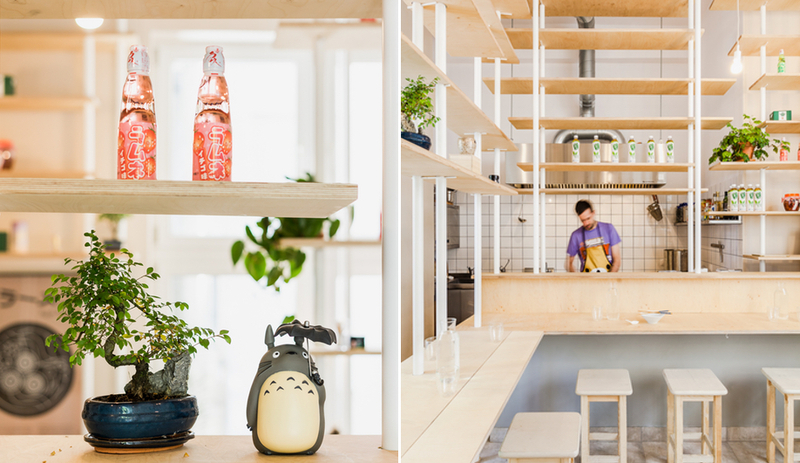 With its no-nonsense moniker and energetic interior, Warsaw’s Vegan Ramen Shop is an attention-grabber. Its name is care of owners Maja Święcicka, Basia Walento and Krzysztof Lesiecki. 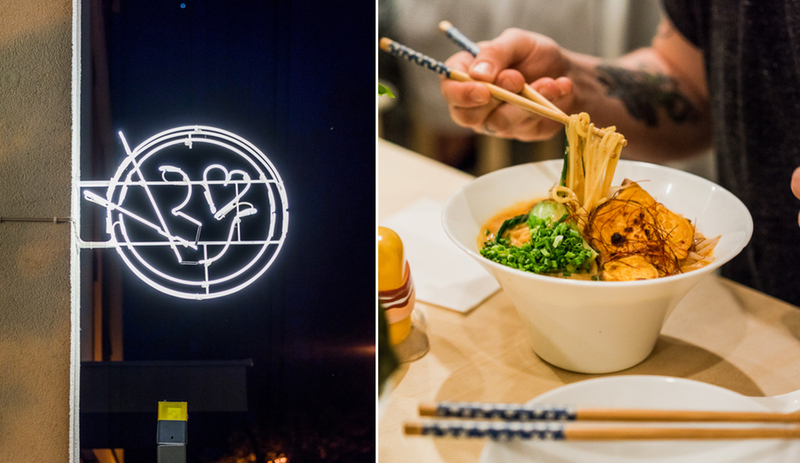 They ran a series of vegan ramen pop-ups around the city before settling into a permanent location, on foodie-friendly Finlandzka Street in August 2017. 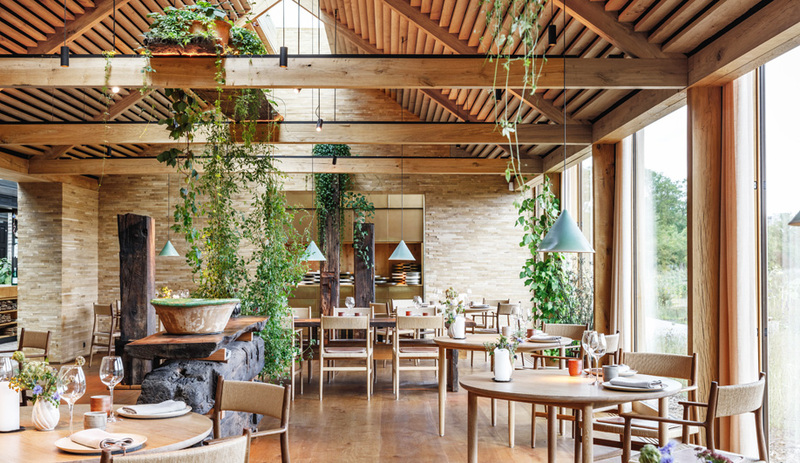 The restaurant’s design, by the emerging architecture and interiors firm MFRMGR, recalls an abstract bamboo forest. 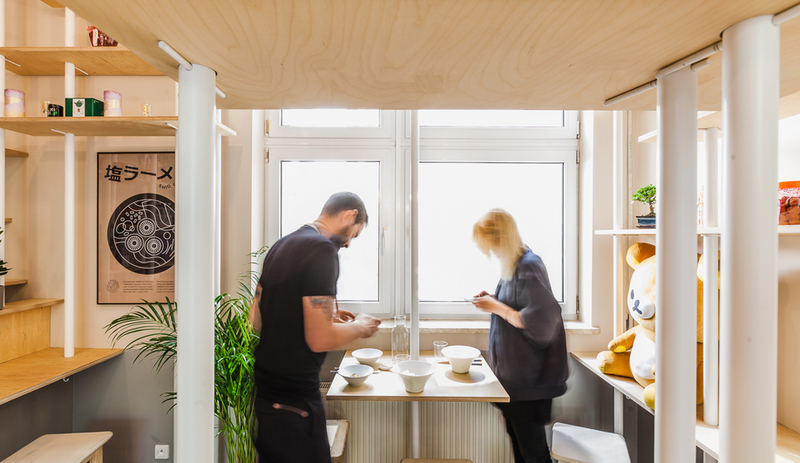 Lucky for the owners, their friends Marta Frejda and Michal Gratkowski – the husband and wife duo behind MFRMGR – know a thing or two about creating eye-popping eateries. 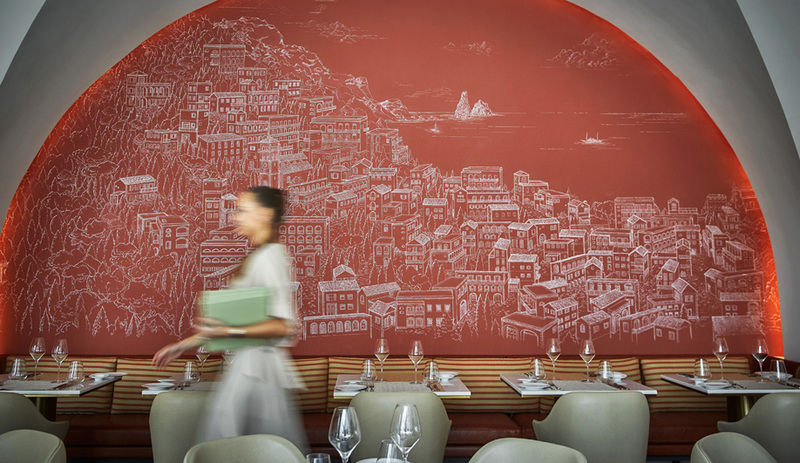 In 2013, they opened Serwus, their very own street-food-inspired spot, which eventually found its way into international design magazines for its bright red-and-yellow line-drawn feel. For VRS, Frejda and Gratkowski set out to craft a modern, minimalist interior catering to the latest iteration of Warsaw’s vegan obsession. According to the Polish-language version of Forbes, the country’s capital is the third most vegan-friendly city in the world, after Los Angeles and Berlin. The clean-lined design is communicated from the outset, with the pictographic neon sign that announces the restaurant’s street-front presence … in a not-so-attractive building from the early 2000s. “It’s a rather ugly place,” Gratkowski says. 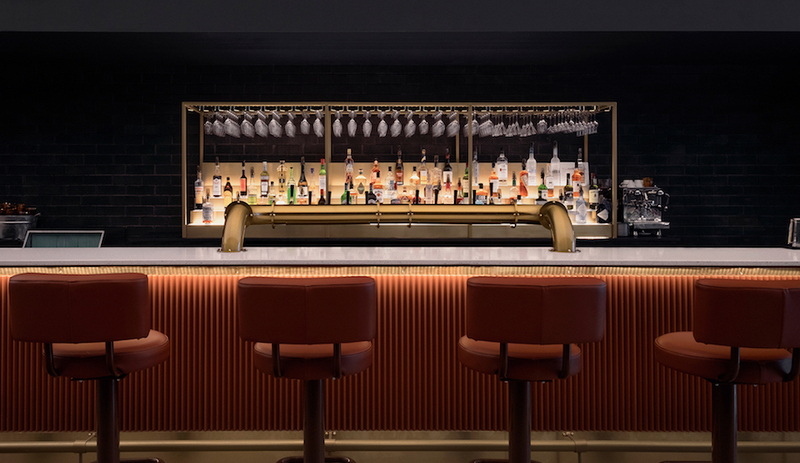 His matter-of-factness underlines the warm and inviting spot they inserted into the small, 34-square-metre footprint they had to work with. 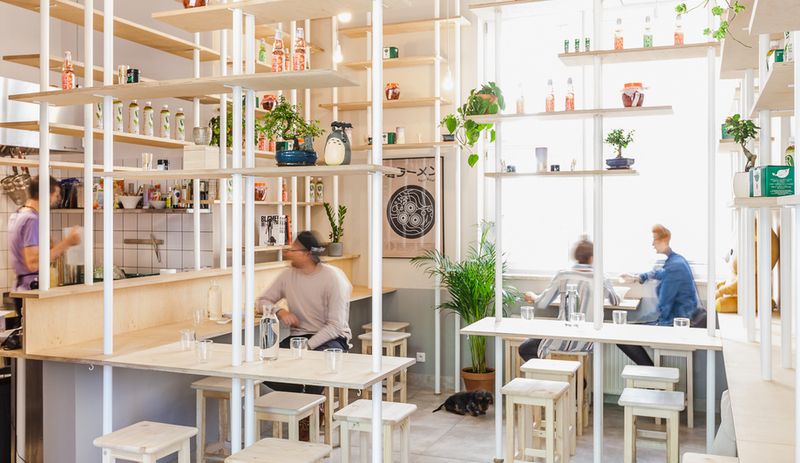 The designers anchored the interior around a long service bar – a nod to typical Japanese ramen bars – outfitted with simple stools. Then they animated the space with floor-to-ceiling poles, made of white-painted steel, that support a system of floating shelves. 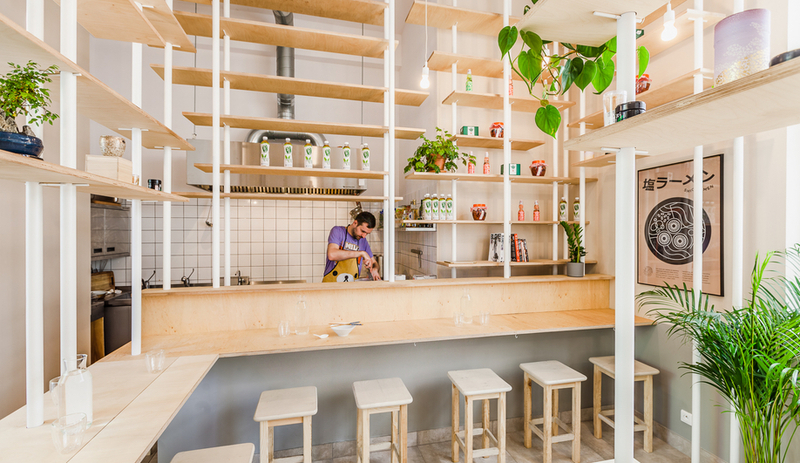 Used both for dining and display, the laminated plywood surfaces are suspended at different heights, delineating cozy nooks that entice patrons to explore the eatery more deeply. 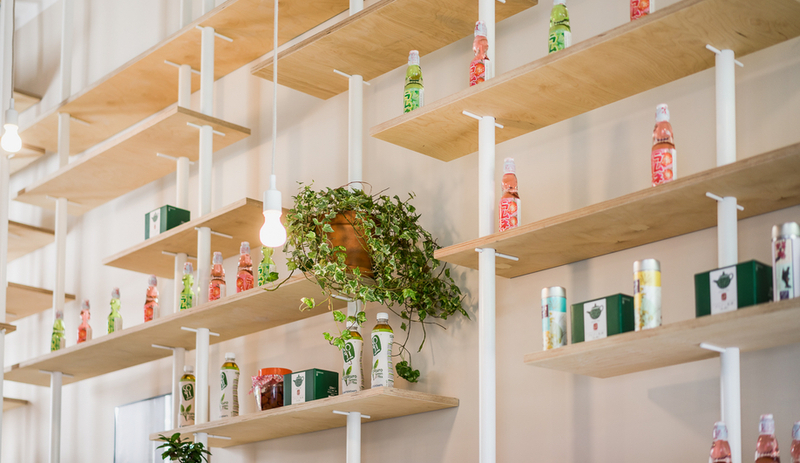 Lightbulbs on braided cables illuminate the shop, while Japanese products – bonsai plants, gadgets, knick-knacks and Manga comics – are showcased gallery-style. Sure, the interior might evoke a bamboo forest – or, an architect’s version of one! – but it also calls to mind the very urban motif of scaffolding. It reflects the fresh, modern language in the growing portfolio of MFRMGR, which has graduated to commercial offices, residential projects and more. Alas, Serwus, their first test-kitchen for bold hospitality ideas, was later sold and then remodeled by the new owner. 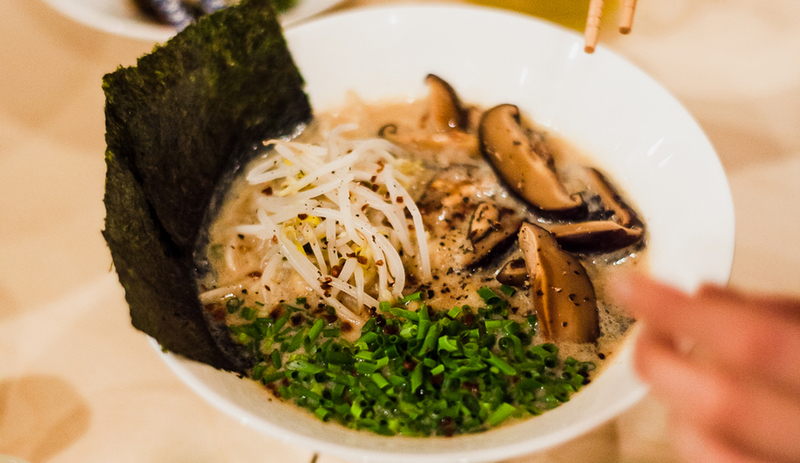 Here’s hoping Vegan Ramen Shop has true lasting power.